Life In The East End Of London - Insanitary Dwellings 1889. There is no doubt that the living conditions in some parts of the East End of London, in the latter half of the 19th century, were appalling. 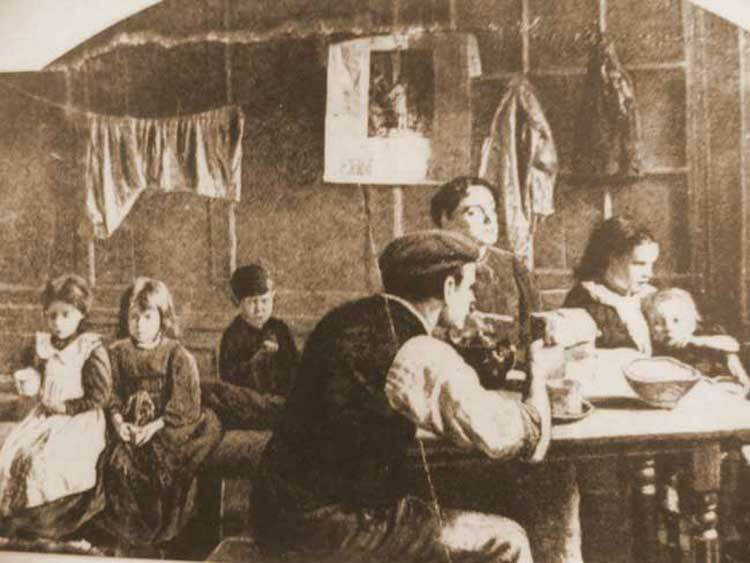 Whole families were forced to cram into rooms in overcrowded houses, the majority of them owned by absentee landlords, who lived far away from the area, and who spent as little as possible on the upkeep of the properties in order to wring maximum profits from their unfortunate, often poverty-stricken tenants. If there was one thigs that the Jack the Ripper murders did, it was to expose the awful social conditions in the area and. over the next few years, more was being done to t to tackle the issue of the conditions under which the poor of Shoreditch, Spitalfields, Whitechapel and Bethnal Green were forced to exist. In November, 1889, the landlords of one particular set of dwellings were taken to court for allowing their premises to deteriorate to such an appalling state that, in the words of several witnesses, the only way to improve the dwellings would be to demolish them. “At the Worship Street Police Court, London, last week, the National Temperance Land and Building Company, represented by their secretary, of 21, Charterhouse Street, Holborn Circus, owners of the premises 9, 10, and 11, Ann’s Place, Boundary Street, Shoreditch, appeared to a summons taken out by Mr Bennet Burleigh for allowing a nuisance to exist on those premises, rendering them injurious to health and unfit for habitation. Mr Temple Cook, barrister, represented the company. Mr Smith (Rollit and Sons), for the prosecution, said the state of the premises was such that the walls were damp with rain coming from the roof, rats were running all over the place, and some of the water closets were without a water supply. The rooms were so small that often a man with his hat on could not stand upright. Charles Thorpe, living at 11 Ann’s place, said that he had lived in the place for between four and five years; he now occupied two rooms on the second floor, for which be paid 5 shillings a week; the rooms were small, and the rain came in under the windows, where the mortar was broken. The rats ran all about the place downstairs. He had lived in another house in the court, and found it about the same. There was a dustbin in one place under the stairs. There was much smell, and there was an old closet which had been turned into a landing for the stairs. The closet was not abolished, but covered over, and the wall pulled down. The court contained twenty houses, two of which were shops. At present, there were twenty-three rooms in the houses occupied, 106 persons living there. Witness had a family of seven children, three daughters and four sons, aged between 20 years and 18 months, and they lived with him. He was obliged to live there to be near his work. Nothing had been done since 1888. Mr Cooke having elicited from the witness that he was not the complainant on the summons, took objection that Mr Bennet Burleigh, not “being an inhabitant,” could not figure as the complainant. The magistrate, after discussion, ordered the name of Charles Thorpe to be substituted. Ann Simpson, living at 9 Ann’s place, said that her room was divided by a thin partition from a stable, and the smell was very bad. Mr Alexander, a sanitary inspector, said the premises were insanitary, and, in his opinion, unfit for habitation, and nothing that could be done to them that would make them so. He admitted in cross-examination that he had taken no proceedings. Asked why not, he said that the premises had already cost £537 of public rates and he thought it useless to spend more money on them. Mr B. G. Burleigh, of Orlando road, Clapham, said he had during the past six weeks been visiting in the neighbourhood of Shoreditch, and he had seen the houses in Ann’s place. He testified to their insanitary condition. He had no hesitation in saying that the place could not be improved – unless by pulling down some of the houses and making it a thoroughfare, but that would leave only two or three houses instead of twenty. Mr Enoch Walker, vestry clerk of Shoreditch, called by the magistrate, said the premises, in his opinion, could not be made satisfactory if the owners spent any amount of money on them. The Court was adjourned for three-quarters of an hour, while the magistrate, with parties on each side, went to Ann’s Place. On resuming, the magistrate said that he had not the smallest doubt what he ought to do. He had found the premises unfit for human habitation, and it was almost a mystery how some of the families there existed at all.